Porto Cristo is a coastal village and a port on the east coast of the island of Majorca in the Balearic. 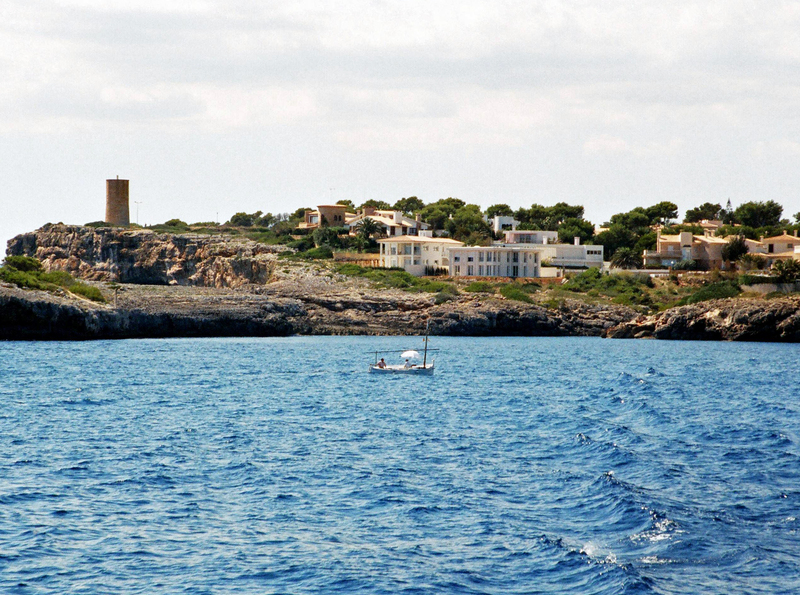 Porto Cristo is part of the municipality of Manacor, in the county of Levant (Comarca de Llevant). 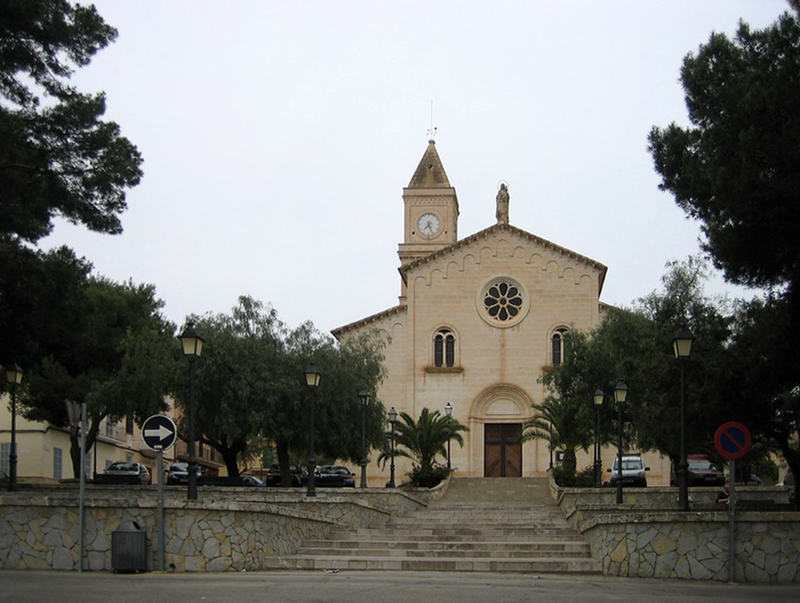 The village population is around 7,500 residents inhabitants, about 20% of the population of the municipality of Manacor. In summer, with the influx of tourists, double the population. The name of Porto Cristo comes from the Latin "port" infinitive "portare" and Christ (bring Christ), and not the word "port" which is written "port" in Spanish or Catalan "puerto" in Castilian Spanish, Porto Cristo is sometimes spelled Portocristo. Porto Cristo means "Bring Christ": this name comes from the berthing of a ship, providing a picture of Christ and an image of the Virgin and Child, circa 1260. The crew of the Italian fishing boat, as he faced a storm at sea, had promised to let the images of Christ and the Virgin if the sailors arrived alive at a port, and finally they arrived safely in the bay is now the bay of Porto Cristo, and they gave the pictures as promised. The image of Christ brought the boat was left to the town of Manacor, while the village of Porto Cristo does not yet exist, this image can be seen in the church of Sorrows (Església dels Dolors) to Manacor. 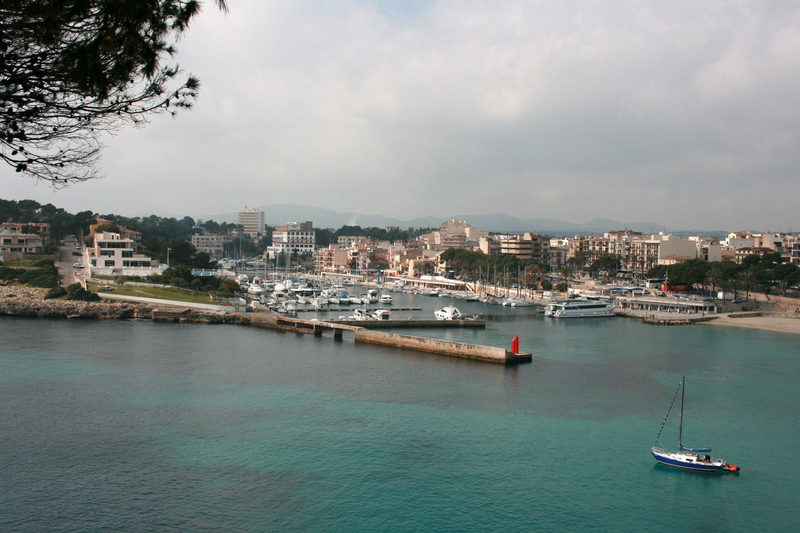 Porto Cristo is sometimes called Port de Manacor, or simply Es Port. During the brief occupation of this part of the island of Mallorca by the so-called "Republicans" - from 26 August to 4 September 1936 - Porto Cristo was renamed "Puerto Rojo" (Red Port), the Republicans were quickly repelled by the Phalangists supported by the Italian aviation. The village of Porto Cristo is a natural harbor in the bay of Cala Manacor, between the promontory of Morro de sa Carabassa (the "point of the Pumpkin") and the small peninsula of Punta Pagell. This natural protection to it being very popular with boaters. 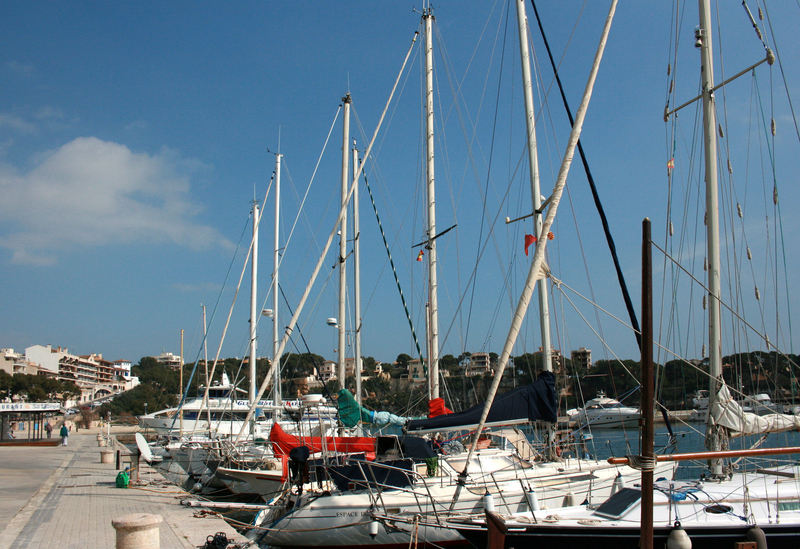 Portocristo was once the port of Manacor and is located 13 km east of the city, and 63 kilometers east of downtown Palma. The neighboring towns of the coast are the twin cities of Cala Anguila - Cala Mendia southwest and S’Illot - Cala Morlanda northeast. south from Portocolom (20 km) and Cales de Mallorca (16 km) by road Ma-4014. 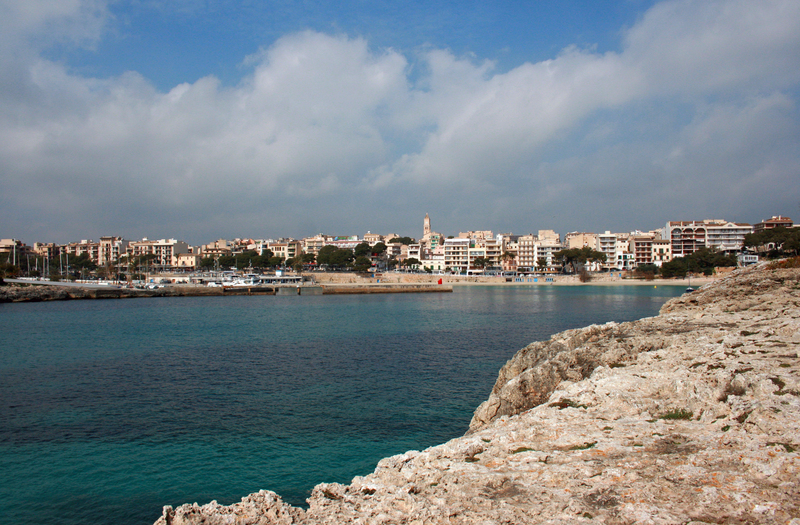 Porto Cristo - once a small fishing village - has a picturesque old town with narrow streets and many historic buildings. The old quarters of the former fishing village located north of the port. In the center of Our Lady of Mount Carmel parish church is located. Most shops and restaurants are concentrated instead on the Passeig de la Sirena (Course Mermaid) behind the pier. On this walk is, since 1988, a sculpture by Pere Pujol replacing the Mermaid statue destroyed during the Spanish Civil War. On Sunday morning there takes place the market with natural products from the region. New residential areas surrounding the city are covered with villas that seek to maintain the local style. These residential areas have gradually expanded, so that now the southern suburbs extends around the bay of Cala Manacor, which leads to the Torrent de na Llebrona, to the Dragon Caves and the bay of Cala Murta, in the northeast, the city goes to the Caló de sa Ferradura. The boundary of the city in the northeast of the junction of Highways Son Carrió and Cala Millor. The westward expansion of the settlement area has it, was arrested by the sinuous bed of Es Riuet (the Stream), the Torrent de na Llebrona. The Church of Our Lady of Mount Carmel, located on Plaça del Carme, is dedicated to the patron saint of fishermen and sailors, the Mare de Déu del Carme. It was built from 1916 to 1922 in the Romanesque Revival style. Between 1957 and 1964, it was enlarged, a steeple added and the apse rebuilt, and was officially opened in its current form July 10, 1964. The ruins of the early Christian basilica of Sa Carrotja (fourth-fifth century) are one of the few vestiges of primitive Christianity on the island of Majorca. The ruins of the Basilica baptismal font were discovered in 1909 at the beginning of the Avinguda d’en Joan Amer the peninsula of Punta Pagell, there is a small pool in a cross where neophytes were baptized by immersion. The little bay of Porto Cristo (Cala Manacor) opens to the southeast and appears almost closed on the right by the promontory called Morro de sa Carabassa (Point of Calabash) at the end of the promontory with a lighthouse built in 1851. At the bottom of the bay is the mouth of the Creek (Es Riuet), the popular name of the confluence of and Torrent de na Llebrona and Torrent de ses Talaioles. The discovery of the wreck of a Roman ship in the port supports the hypothesis that the port has been used since Roman times. Between Morro de sa Carabassa and the beach, and almost parallel to the harbor entrance, there is a dam, popularly called "Es Martell" intended to stop the waves entering the harbor. The commercial fishing fleet is more than symbolic: the vast majority of "llaüts" (traditional boats rigged with old sailing Latin) belong to passionate amateurs. At the mouth of Es Riuet, a marina was built in 1969 by Joan Servera Amer. On the northwest side, near the city center, there is also a dock for tour boats in the sea along the coast. 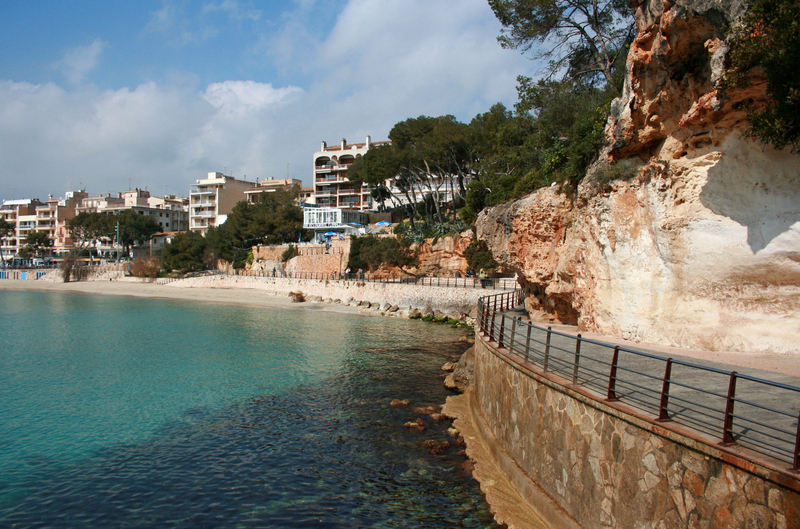 The main beach of Porto Cristo - about 310 meters long - is in the Cala Manacor facing the marina. It runs under the city center, just below the Passeig de la Sirena, from the pier to the south-west to the Plaça Costa d’en Bau northeast. It is well protected from the wind range. In 2006, this beach of fine white sand, was awarded the "Blue Flag" for the quality of its water. However, in summer, the heavy traffic of boats, right next to the beach, make the water quality is not as good as other beaches, swimmers are however many. Other cleanest beaches are Cala Petita accessible only on foot, and Cala Murta, at the other end of Porto Cristo. The Tower of the Serral dels Falcons is the emblem of the city of Porto Cristo, and appears on its crest. This is a watchtower and defense built in 1577 in order to monitor the coast and prevent coastal populations in time of landing of Moorish pirates. The tower was part of the Hawks network watchtowers coast of Majorca, which communicate by signals from one to another. 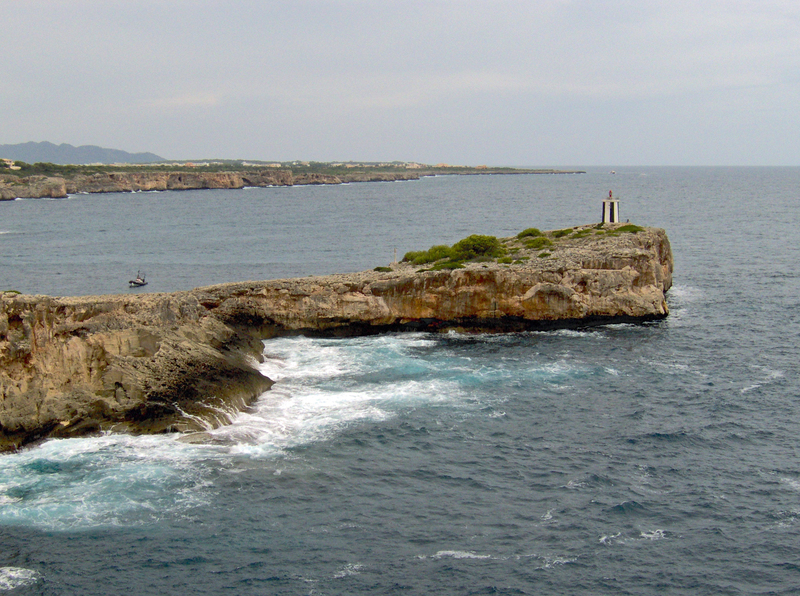 The tower is at the end of the avenue Joan Servera Camps, south of the entrance to the cove of Porto Cristo. The tower is also known as the Torre de Porto Cristo or historically as the Torre de Manacor, Torre de Cala Manacor or Torre del Port de Manacor. History records that the construction of the tower was very quickly in 1577, to 1693, the tower had two turrets in 1769, it had a three-pounder. In 1794, the tower was in poor condition. In 1936, the Tower of Hawks was partially destroyed by bombing the Republican said forces during their temporary occupation of the east coast of Majorca. In 1960, the owners of the land did rebuild. The tower on the edge of the cliff, offering stunning views of the bay, the lighthouse and the nearest coastal towns. It can be visited for free. 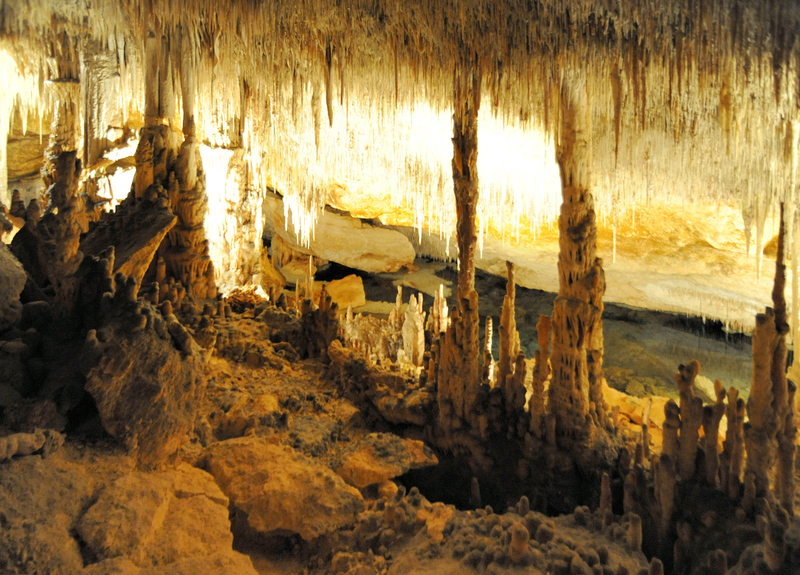 The city of Porto Cristo has a wealth of size: caves. The entire coastal area of the cliff near Porto Cristo is dotted with caves and rock shelters innumerable, entries generally being at sea level, often below. 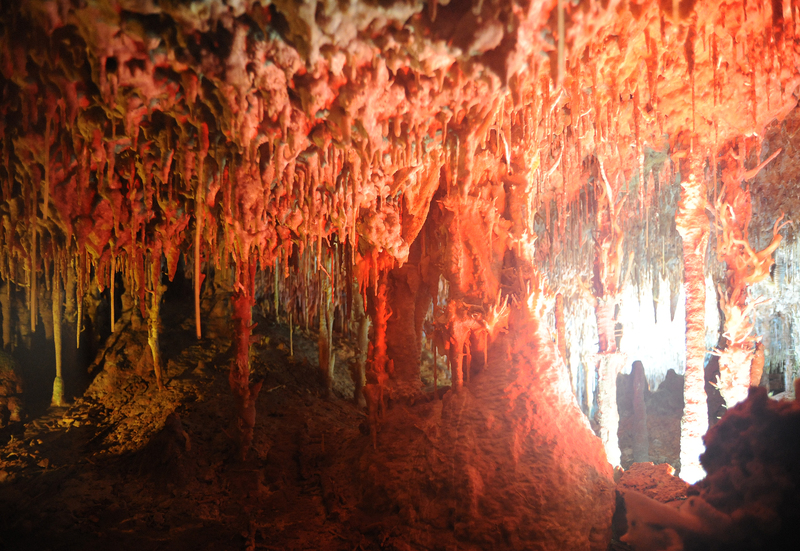 The visit of these caves is not without risk, as the Cave of the Pirates Cala Falco south of S’Estany d’en Mas. Two largest caves were developed for tourism: the Caves of Harpoons (Coves dels Hams / Cuevas de los Arpones) and Dragon Caves (Coves del Drach), carved by thousands of years of erosion, with sharp shapes and well developed by artificial lighting. Small caves are located on the Cala Manacor near the beach of Porto Cristo, such as Cova de Sa Patroneta the Coves Blanques and Cova des Correu. The White Caves (Coves Blanques) are located on the beach of Porto Cristo, at the end of the Promenade and is accessed by a walkway along the bay. They are remarkable for their peculiar whitish where their name comes from. These caves were converted into caves to talayotic time. They later served as a refuge for fishermen and sailors until the late nineteenth century (1877), and constitute the primary center of the town of Porto Cristo. It was in 1888 that Jordi de San Simon Muntaner, marquis del Reguer, created the first subdivision that gave birth to the city of Porto Cristo, under the name of Colonia de Nuestra Señora del Carme. The local festival is July 16 in honor of Our Lady of Mount Carmel (Mare de Déu del Carme), patron saint of the city. For the occasion, held a fireworks display, a procession of fishing boats in the bay, and a night market on the promenade. Summer hours (May to October): Monday to Friday, 9:00 to 16:00. Winter hours (November to April): Monday to Friday, 9:00 to 15:00. Line 451: S’Illot, Manacor, Valldemossa, Deia, Soller, Port de Sóller. Line 447: Port of Alcúdia, Manacor, S’Illot. Line 445: Alcúdia, Port Pollensa. Line 442: Cales de Mallorca. Line 441: Cala Ratjada, Capdepera, Calas de Mallorca. Line 433: S’Illot, Sa Coma. Line 416: Cala Romàntica, Manacor, Palma. Line 414: Palma, Manacor, S’Illot, Sa Coma. Line 412: Palma, Manacor, S’Illot, Sa Coma, Cala Millor. There is a Bus Service + Train with which you can reach the station of Manacor, where you can take trains Serveis Ferroviaris de Mallorca (SFM).